Mother's Day is a great day to celebrate and to gift – on the one hand you do celebrate the person who is responsible that you are here and second it is a tremendous time to celebrate in early may (at least in middle Europe mother's day is on the second Sunday of May). Mother's Day is a great party in late spring: blooming bushes, lovely colourful flowers, cakes with the first fruits of the season – and if we are all lucky it will be sunny. Our Mother's Day craft idea consists of a free printable of mother's day coupons and a craft idea on how to gift the coupons or vouchers. You can use the free printable for many more occasions they make a great gift for father's day as well, or "I-will-support-you" coupons or "summer-vacation-starts-and-I-ll-help" surprise gifts. Self made Mohter's Day gifts are the best and therefore kindergarden and schools are busily crafting in April and the beginning of May. 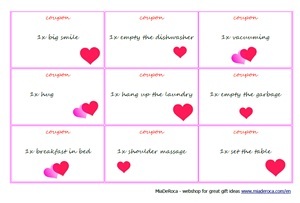 No matter if your Mother's Day gifts are self made or self bought, you can always add this personal touch with individual vouchers or coupons, where you gift your precious time. Here you can download and print out the free printable Mother's Day coupons (pdf). Open and print out the gift coupons and cut out. We use woollen flowers for our never wilting bunch of flowers, because it is so easy to attach them to the skewers – pinch through several of the threads on the backside. 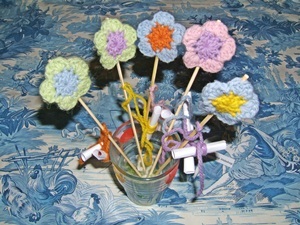 If you have paper flowers or fabric yoyos use hot-melt gun to glue. 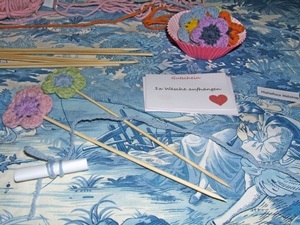 Tie the yarn to the skewer a vie centimetres (1-2 inches) under the blossom, make a knot. 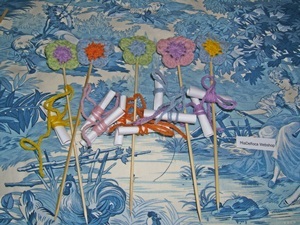 You will tie the gift coupons to the flower with these yarns. Roll one of the vouchers, use one side of the yarn and twist several times around the middle of the voucher and tie with a half bow. You will tie two vouchers to four of the flowers and on the fifth flower only use one coupon. You can use the flowers as table decorations on mother's day and lay them on the table or put them into a vase. To keep the skewers in the vase we did fill the vase with ends of wool (in every household where people are knitting or crocheting in several colours you have plenty of wool ends – this is a decorative way to make use of them). This craft idea is also a great way to gift money an ever-lasting flower bunch will help you gift bank notes in a decorative way. Beside the coupons you could use gift certificates as well. 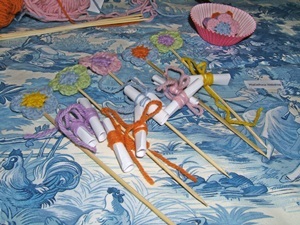 You are in the mood of more crafting ideas with kids, have a look at Saras Blog and her Craft Schooling Sunday.